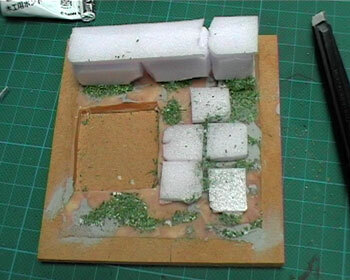 Even for small dioramas, you will need a lot of material. 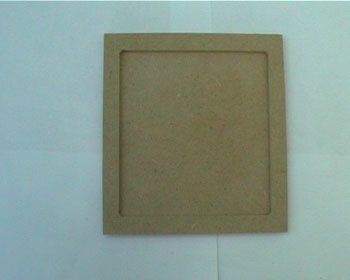 Well, less material will do, but more is better in this case . Next up: the cutters. You've got a big stanley knife and a small one (both from hardware stores). WARNING! 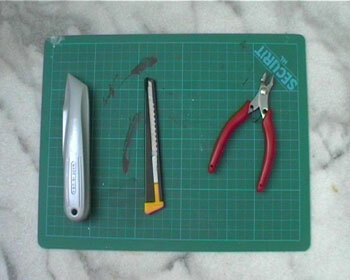 If you are NOT using these knives, always make sure the blade is inside the knife! ALWAYS be careful when handling these extremely sharp knives! 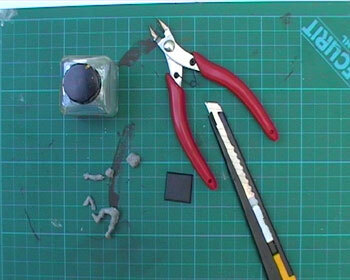 You also have a clipper, for cutting through plastics and small pieces of metal (available through hobby stores or from Games Workshop). The green thing is a cutting-board, so you don't mess up the table. The glues are equally important, you will need several. 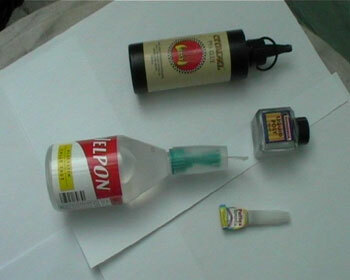 The big bottles are PVA glue (from citadel) for "flocking", and the other one is 1 that glues everything (brand: Velpon). 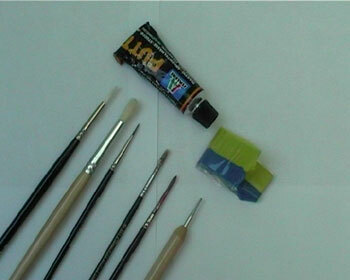 The smaller bottles are plastic-glue and super-glue (glues in seconds). Your brushes are for painting duh! But I can't give you advice here, I suggest you check out Bobby Wong's article on this subject. The inspiration came when I was flipping through the Rackham universe book. I was really drawn to the brutal nature of the Devourers, evil Wolf warriors that give in to their instinctive nature and eat their enemies. Originally I wanted to make one of their hated enemies, the Dirz, run away in fear. But that idea changed a couple of days later, when I was sketching out the idea. 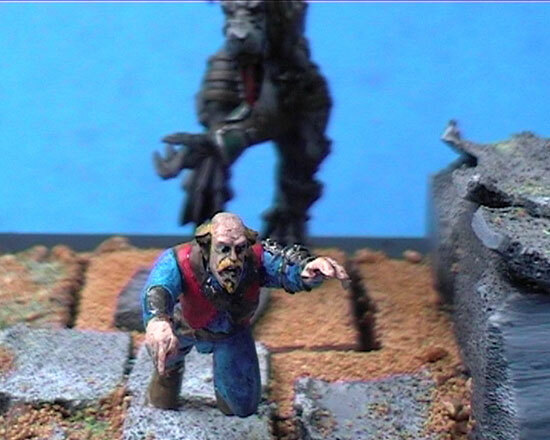 Someone around me mentioned how Rackham mini's were so much better than "the hated GW" and that gave me an idea, a GW Empire soldier, running away in fear from a Rackham devourer. I decided on making this a very small diorama. Only 2 mini's and not a lot of scenery. 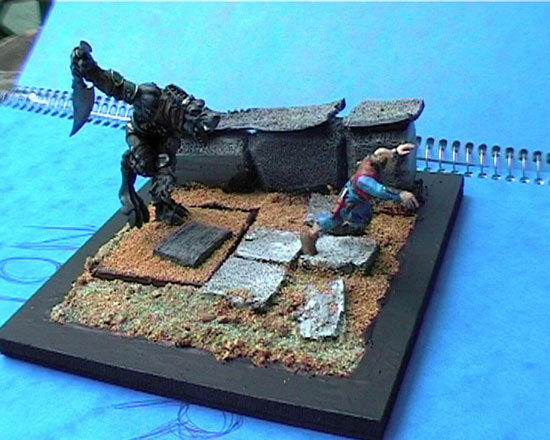 Because you don't have to make BIG dioramas every time, you can really bring the focus on the miniatures interacting. This is the base I'm goin to use, I bought it in a craft store, you know, the kind where they sell stuff for making puppets (fimo). It comes in 2 parts and it's almost like a coaster for putting your drink in. Now that we have an idea, worked it out a bit (you don't have to go in extreme detail) and we've got the setup, it is time to start working! Grab the cutters and glue because we are starting work! 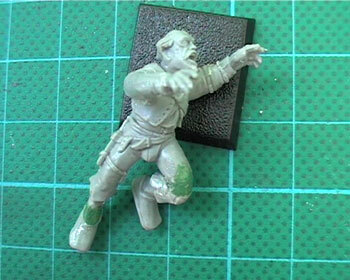 First we'll do the conversions on the 2 figures, then we can start work on their environment. 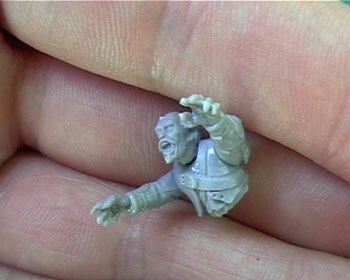 This one is actually quite easy since the figure itself is a standard empire warrior from GW. 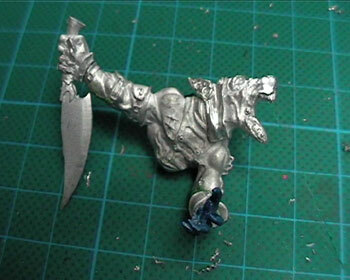 Another advantage is that he is plastic, so cutting is easy and so is gleuing him together again. First I picked out all the parts I was going to need from my bitbox. These are all standard, so no problems there. 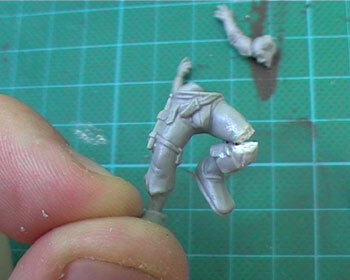 I the took the legs and made a cut in the back and front of the knee, almost like cutting 'V's out of his leg. Then a bend was made so the leg was up against the thigh. (I needed him running in fear, remember?). I did the same to the foot on his right leg and used green stuff to put em back on in a different position (just pu a small blob of stuff on the joint). If you've never converted before, these are your very first steps! Congratulations! 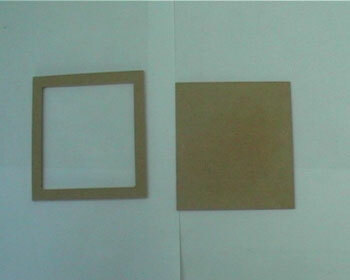 Now, don't worry if the joints don't have the desired shape. You'll file off excess stuff, when it has hardened (this takes a day to become real hard). 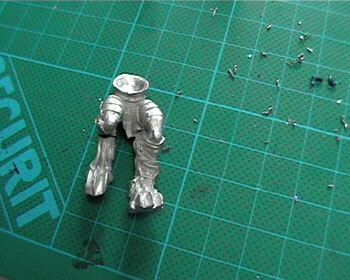 Next was the torso and head. I chose the head that looks like he's yelling, it should give hime more character. 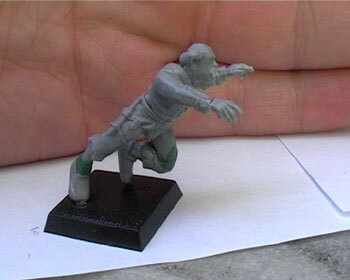 The left arm is standard, no conversion made there, but the right arm IS a conversion. I took a hand off of one of the bow arms (the one holding the arrow) and attached it to a straight right arm with the sword hand cut off. This was done so he looks like he has dropped all his weapons and is now running for his life. When everything was dry I glued the torso to the legs to get an idea how things would look (if you use normal plastic glue it takes a while for it to stick, so you can move the torso around and try out some positions before letting it stick. You can also use blue-tac for this). 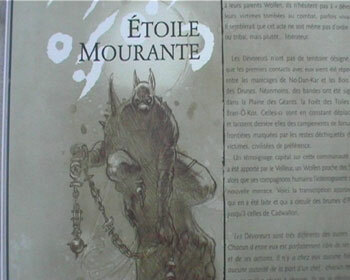 With him drying, we move on to the devourer, our real challenge for the day! 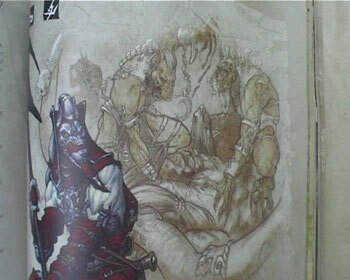 On the left you have the original devourer. A huge Wolfen with a menacing looking boomerang. Now, in a game of confrontation the headhunter looks great sitting on his tiny branch, but here in our diorama it wouldn't fit. I wanted him to run and while running, claw at it's victim. 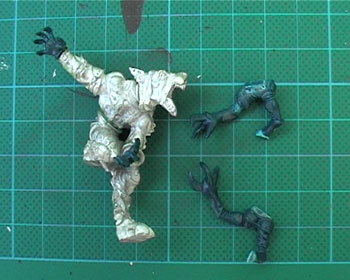 So I went to my bitbox and found 2 great-looking genestealer arms (GW). I measured if they would fit in scale and "Hurray! ", they did! 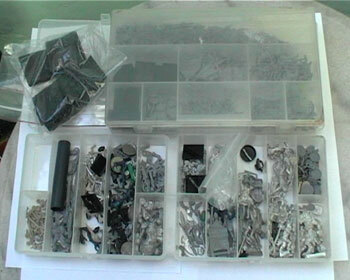 Now, converting metal miniatures is somewhat more difficult than plastics. You'll need a strong clipper and sometimes a small saw. Also a fine drill can be helpful if you wish to pin everything in place. So.... I liked the torso and legs, but not how they were. 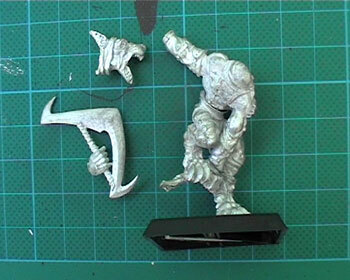 I sawed the trunk of the devourer and removed his right foot in the process (accidents do happen). But figured that wasn't a bad thing since he needed a "running" foot off the ground. The original left arm also pointed towards the ground, I figured a running person won't be pointing toward dirt, so I clipped it of at the elbow, reattached it with glue and greenstuff so it would look like his arms was bended in a running, clawing kind of way. I attached the body and head. Firmly attached the hands to the arms with super-glue. OK, now crap does seem to happen and since I can't make "the perfect diorama" from the start, these problems are arising as I go. I went to the store to buy me some nice wolfenfeet, but forgot to pack my devourer in a box WITH tissue. The right hand fingers broke, so a new hand had to be found. The wolfen I had just bought had a nice knife in his hand so I took that one. I also pinned the foot in place. Remember the base from a few pages back? 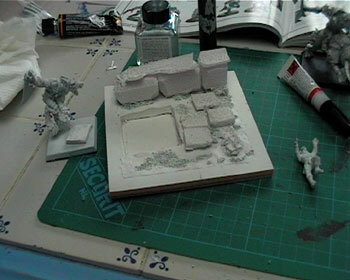 Well, we are now going to fill it up and construct a small scenic base for the models. The entire process here was also the first time I tried this, so it was an experiment for me. 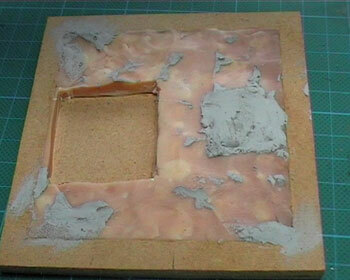 I had bought some "Fimo" earlier and it's a clay that remains soft until you bake it for 20 minutes at about 130°C. I filled the base up and left some space for the bases of the mini's (I later changed my mind about the soldier and filled his place up with putty). While in the store the owner gave me some material to make bricks and a wall with (isolation-material that doesn't crumble put cuts easily). So I did just that, made a wall and some tiles to fill the base with (thanks Rick!). I added some flock to the base before I undercoated it, sort of "texturising the ground". With everything undercoated, I could start painting! Turn the page friends! So, Here it is, the paint-job. 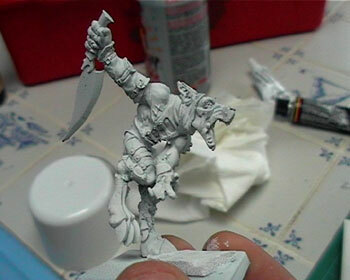 i wanted the Wolf to look dark and the soldier bright as GW tends to use bright colours. It's also fun as bright colours represent heroics, so this "hero" is scared and running (probably crying for mom too, I know I would if a 250 kilo wolf is chasing me). 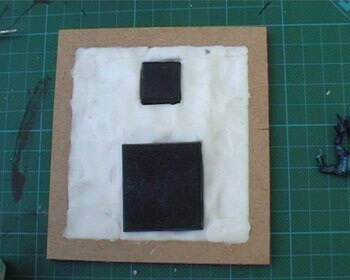 I also suggest making the surrounding base dark, very dark, as it pulls the eyes towards the actual scene. A base too light distracts the viewer. I used black here, but you can also use dark browns or a similar dark colour. Now then, the paintjob isn't fantastic. 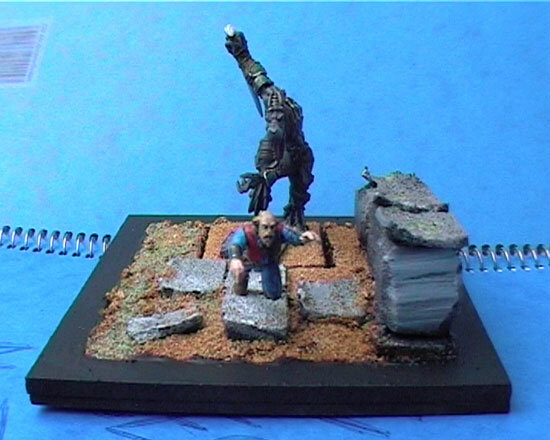 But then again I'm not a fantastic painter and the real essence is the diorama. How it all came together. Also sorry for bad pictures, I still don't have a decent camera or photo-rig. 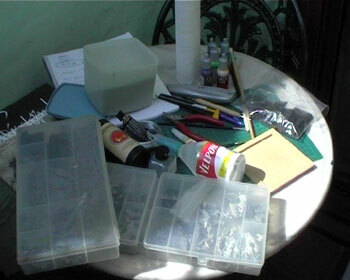 The idea here is to have fun in making a diorama from start to finish. It's not that hard when you think of it, just try to pick something that isn't too difficult and you'll be fine. It all just depends on the theme. Are you still reading this? What do you mean "yes"? C'mon start on your own diorama! Go, go, go!!! Have fun and good luck! You can email me any time if you want to talk about anything in more detail.